I always knew it. Aliens want to probe our cute little animals. Pigs could get oinked at any time. Chickens are about to get clucked. Cows are utterly unsafe. Ok I’ll stop. But are these aliens really all that bad? Maybe if we stepped into their UFOs for a while and see how it feels for ourselves? If you too want to capture sheep and take them off into space to do unspeakable things to them, you now have your chance! And you can thank Under Clouds for giving it to all us as a universal app for the decent price of $1.99. BeamOut is essentially Katamari Damacy in a very simplified form. 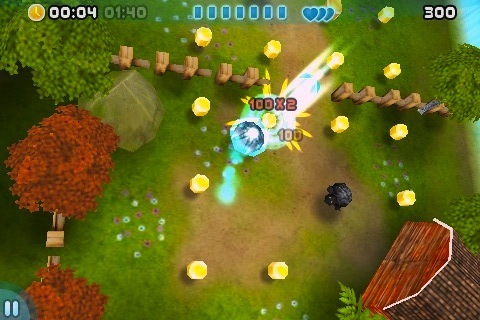 You “roll” your UFO through iDevice tilting or on screen directional pad. The UFO will move around collecting powerups, avoiding enemy UFOs and barrels of explosives, and collecting yellow pegs and sheep. You have a shield around your ship you need to keep up or else you’ll be destroyed. If you get damaged, your shield gets slices taken from its circular form. Eventually you start looking like Pac man running around eating yellow balls and dodging traps/enemies, and suddenly BeamOut just became a few levels more awesome. The general feeling I got from playing BeamOut was that it just wasn’t impressive. It’s a like a theme of having issues that are slightly balanced out so the game isn’t bad but can’t hit perfection. The gameplay is hindered by controls, which require quite a bit of gameplay to adjust to since the UFO just moves so awkwardly, but that is balanced out by a decent d-pad control scheme. The graphics are well executed, crisp, and clean, but it’s just so boring. No notable standout graphical elements. I would have loved to have seen more of a whimsical cartoony world with exaggerated proportions or maybe somewhere outside of earth so we can get some interesting colors. The soundtrack was forgettable though still okay. I was never annoyed but I didn’t notice it until I started writing this review and left the app on. With over 30 levels in 3 environments, the different powerups, laser beams and rockets, and collecting cute little sheep, it’s unfortunate that the game has so many ‘meh’ moments. I will say though, at later levels after you adjust the controls and the yellow pegs causing you to bounce all over the place, the game gets really challenging and there is a final boss that was definitely fun. Since all the notable issues were balanced by something else, I won’t hold it too harshly against BeamOut. 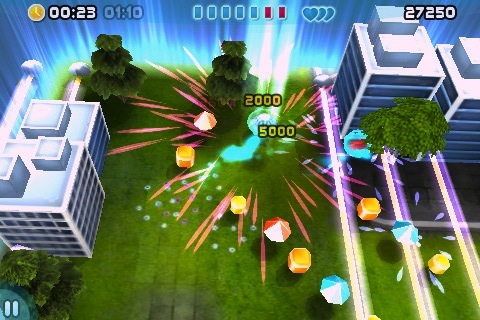 BeamOut is a good game that is just lacking that punch to really make a solid 5. With a slight adjustment to the graphics and maybe some tweaking to the controls and you can have a delightful sheep kidnapping simulator! Try BeamOut for yourself. If you like it, you can thank the aliens (or developers Under Clouds). If you hate it, keep an eye out for those UFOs that will come and punish you but don’t worry. They don’t have great controls so they will go slamming into walls and miss its target constantly. AppSafari review of BeamOut was written by Joseph Ho on February 9th, 2011 and categorized under Action, App Store, Games, iPad apps, Physics Based, Resource Management, Universal. Page viewed 3224 times, 1 so far today. Need help on using these apps? Please read the Help Page.